A woman, a poet and a quest to reclaim the zest for life! Intelligent, funny, handsome, troubled and sexually ambiguous, prolific poet Lord Byron left England for Europe in self-imposed exile in 1822 and was never to return. When journalist Julietta Jameson comes to a crossroad in her own life, she looks to the poet she's admired since childhood and decides to set out on her own travels across Europe, following in Byron's footsteps. She knows that she is embarking on her own passage of exile, one that will allow her to cut ties of her own and experience life in a whole new way. 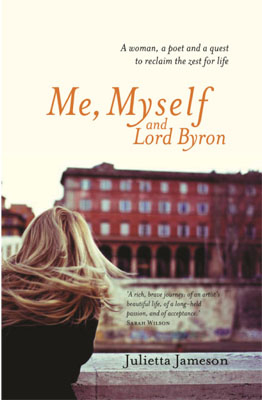 Me, Myself and Lord Byron explores the life and work of Byron as Julietta follows his trail through Switzerland, Italy and Greece. Not only does Julietta explore the life of works of Byron, but examines the life of her 40-something-year-old self before she commenced her trip - a life that was tainted by a troubled upbringing, consuming career, problems with alcohol and a swathe of failed relationships. Julietta Jamesonis an Australian journalist with over 20 years of international media experience as a columnist, news and feature writer, travel writer, editor and foreign correspondent. She is the author of four books: Tibooburra and the Legend of the Tree of Knowledge; Christmas Island, Indian Ocean; The Ties That Bind; and In Her Mother's House. She lives in Sydney. Question: What inspired you to set out on your own travels across Europe, following in Byron's footsteps? Julietta Jameson: I had what could be called a crisis, but which turned into an epiphany. I realised I'd been lamenting the life I didn't have, rather than celebrating what I did have. Once I started taking stock of the positives, I began to reconnect to the things that gave me pleasure. One of those was poetry, particularly Byron's. And so, as a kind of celebration of what I did have, which was freedom and the ability to travel and write, I could think of no better talisman to follow than Byron, who had all those things as well. Question: What did you admire about Lord Byron? Julietta Jameson: His authenticity. He was hugely flawed and could be difficult, but he was fully expressed. It came out not only in his writing, but the way he lived his life with his heart on his sleeve. Scandal followed him, he had a turbulent emotional life, but he was a guide for me, both physically and emotionally and spiritually. I followed his travels and the plot points of his life became pilgrimage points at which I could contemplate mine. And of course, I admire his writing. His poetry is sublime. Question: What did you learn about yourself whilst travelling? Julietta Jameson: I learned that I have a great love and capacity for truth. I learned that I have the strength to shine a torch into all the dark places within, even the ones that scare me, and to face up to what lurks there and make peace with it. The truth shall set you free - my motto now. Question: What should readers expect from Me, Myself and Lord Byron? Julietta Jameson: Part memoir, part travelogue, part the story of Lord Byron, this is my journey to self-acceptance told against the sumptuous backdrop of Italy, Switzerland and Greece. But along the way, they should expect some humour, hopefully some insight, and definitely a lot of gelato.